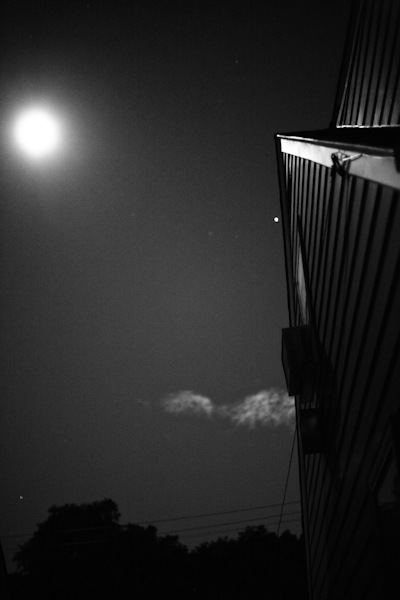 One night in early September, a friend of mine mentioned over dinner how bright the moon was. I agreed with her, but didn't really notice it until I came back home around 11 and saw the side of my house lit by the moon. I took out the fastest lens I have to try to capture it. That led to these different compositions of the same scene. There's another house right next to mine (you can see it slightly on the third picture) that limited my movement, but I was able to experiment with the placement of the house and the moon. Here's four photos from that impromptu shoot. My pick of these four was the first one. Which one would you choose?